Talking Heads Hair Salon (321) 984-9795, 5000 Stack Blvd, Suite A-3, Melbourne, FL 32901 A full service hair salon for woman and men - haircuts, hairstyles, coloring, extensions, shampoo, blowdry, perms, highlights, relaxers, up do's, nails, manicure, pedicure. Talking Heads Hair Salon is one of the best full service hair salons on the east coast of Central Florida. Call today 321-984-9795. We have been proudly taking care of our large clientele in the Melbourne, Palm Bay, and surrounding areas for over 20 years. We offer a superior selection of cuts, styles, colors, perms, texturizing and finishing services. We have consistently been one of the top hair salons in zip codes 32901, 32903, 32904, 32905, and 32907. We always have a great deal! Click here for our Monthly Specials! We know how important your hair is. The talented stylists at Talking Heads Hair Salon are carefully chosen to be part of our skilled and caring staff. Our stylists are artists who love their craft and are committed to continuing education. They are always ahead of current trends, ensuring you always look your best today and tomorrow. It's All About Making Our Customers Happy. We make sure you are happy with each and every visit. That is why our clients return year after year, continuing our reputation as one of the top hair salons in Melbourne and Palm Bay areas today. We are proud to be a Redken Authorized Salon. We only use the best quality Redken products for all our shampoos, conditioners and color products. Looking for Hair Salons in Palm Bay and in Melbourne. If you are looking for hair salons in Palm Bay we have you covered. 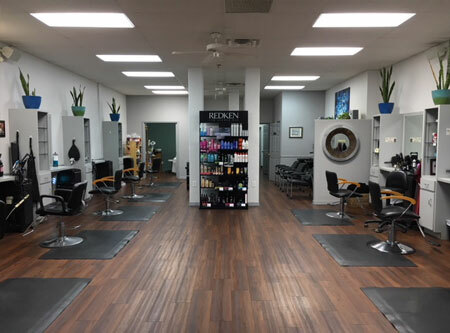 Talking Heads Hair Salon is located right off Palm Bay Road in the heart of Palm Bay. If you are looking for hair salons in Melbourne, our location is also near you. Talking Heads has one great location at 5000 Stack Blvd, Suite A-3 right on the border between Melbourne and Palm Bay at Pam Bay Road. We have been proudly serving the ( 321 ) area code community for over 20 years. Call us or stop by today and start with one of our great monthly specials. Come visit with our talented, friendly staff and see why we turn heads when our cuts make your hair talk for you. We turn heads. Let us make your hair talk for you!